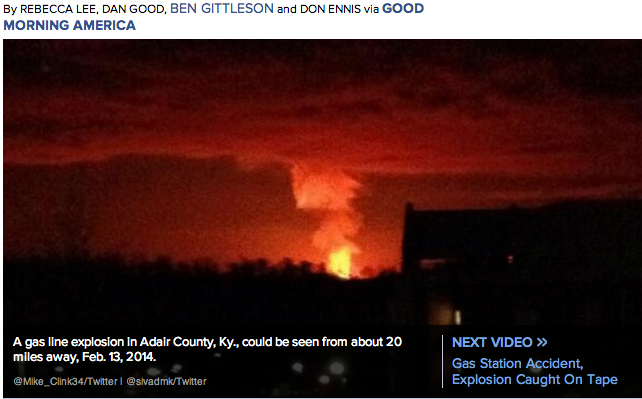 ADAIR COUNTY, Ky. (WKYT) – A gas pipeline exploded in Adair County Thursday morning, creating a 60 foot crater. The Adair County Judge Executive tells WKYT that a natural gas pipeline exploded around 2 a.m. in the Knifely Community, near the Taylor and Casey County lines. The gas line runs from New York to the Gulf and is owned by Columbia Gulf Transmission. The Judge Executive says several homes around the explosion site in the Knifely Community were evacuated. Fire departments from Adair, Taylor and Casey County were called in to help get the fire under control. Adair County Emergency Management Director Greg Thomas tells us that two homes were destroyed by the explosion and another was damaged. Thomas says the gas line was in a hillside and it’s unclear what caused the explosion at this time. Kentucky Emergency Management Director Buddy Rogers says that two people were hospitalized for burns from the explosion, but that both victims have been released from the hospital. He also warned that because crews planned to bleed the gas line and release more gas, those in the immediate area may hear more explosions, but that it would be controlled. Witnesses say the explosion and fire could been seen as far away as Liberty, Kentucky. Red Cross is on the way to help those who have been evacuated from their homes. WKYT – News – Headlines News Weather Sports Video Live 19°F Town evacuated after natural gas explosion in Adair County Updated: Thu 7:50 AM, Feb 13, 2014 Home / News / Headlines List / Article Photo by Michael Clinkscales and Kate Davis Photo by Michael Clinkscales and Kate Davis ADAIR COUNTY, Ky. (WKYT) – A gas pipeline exploded in Adair County Thursday morning, creating a 60 foot crater. The Adair County Judge Executive tells WKYT that a natural gas pipeline exploded around 2 a.m. in the Knifely Community, near the Taylor and Casey County lines. The gas line runs from New York to the Gulf and is owned by Columbia Gulf Transmission. The Judge Executive says several homes around the explosion site in the Knifely Community were evacuated. Fire departments from Adair, Taylor and Casey County were called in to help get the fire under control. Adair County Emergency Management Director Greg Thomas tells us that two homes were destroyed by the explosion and another was damaged. Thomas says the gas line was in a hillside and it’s unclear what caused the explosion at this time. Kentucky Emergency Management Director Buddy Rogers says that two people were hospitalized for burns from the explosion, but that both victims have been released from the hospital. He also warned that because crews planned to bleed the gas line and release more gas, those in the immediate area may hear more explosions, but that it would be controlled. Witnesses say the explosion and fire could been seen as far away as Liberty, Kentucky. Red Cross is on the way to help those who have been evacuated from their homes.